FINALLY! After two years in West Texas...we are back home. Back in my good old 1953 ranch style house in North Texas. We've actually been back for a few months and have been scrambling to find furniture to fill up the two living rooms /3 bedrooms this house has. 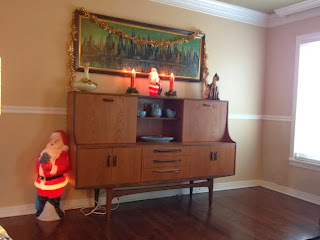 When we to went out west, we sold a lot of vintage furniture so we would have less to haul. It really sucked to come back and see how much we needed to fill rooms up. So for starters, we found this hutch at an estate sale dealers liquidation sale. It was still more than I would normally pay at a garage sale, but was priced well, and we needed it bad. 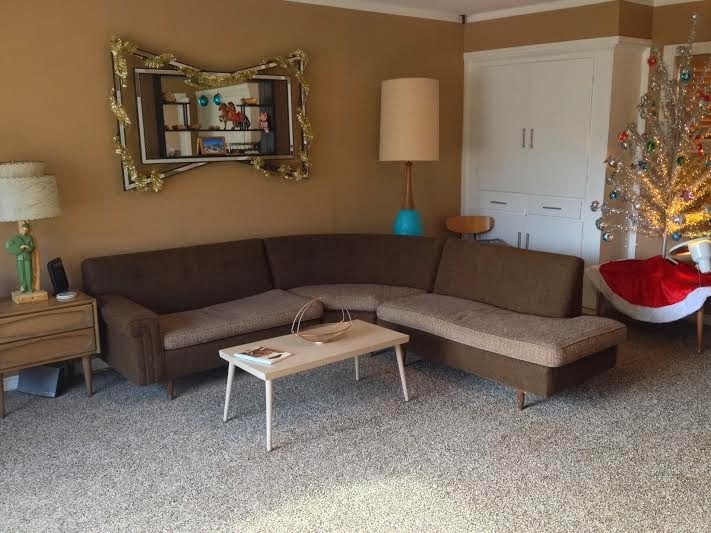 Its in great shape, and looks quite stoic in the 'formal' living room. Something else that was needed (among many other things) was a sectional. I have wanted one for a while now. Thanks to Craigslist, and a nice couple of dudes that were trying to sell it fast, we got this for a crazy good price. It found its place in the den. Hope all is well with everyone and I hope you had a great Christmas! Happiness is being in North Texas. That's all I can say. Welcome home! That sectional is rockin'! And I'm sure in no time at all you'll have the house stocked with vintage goodness! gorgeous! if you got it for less than $300, you scored big! Welcome back home! The place is looking great! Awesome stuff, love the sectional!! I found one about a month ago, but someone had already bought it! I was sad... but that just means they are still out there! I love vintage, mid-century, atomic, Pyrex. It all started when I bought an old fixer-upper in a historic neighborhood. Software professional by day. Part time figure skating coach.